Have a preschooler or kindergartener? SchoolSparks.com has over 75 FREE printable Alphabet worksheets! 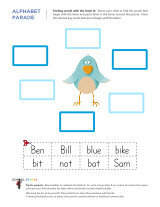 Plus, you can sign up to receive an email when new worksheets are added.